PLO Secretary-General claims Netanyahu is controlling the Palestinians through the Civil Administration and COGAT. Palestine Liberation Organization (PLO) Secretary-General Saeb Erekat on Monday claimed that the “acting president” of the Palestinians is none other than IDF General Yoav Mordechai, the Coordinator of Government Activities in the Territories (COGAT), a Defense Ministry unit which coordinates civilian issues between the Israeli government, the IDF, international organizations, diplomats, and the Palestinian Authority (PA). The reason for this, claimed Erekat, is that Prime Minister Binyamin Netanyahu is controlling the Palestinians through the Civil Administration for Judea and Samaria, making Mordechai acting president and not PA chairman Mahmoud Abbas. In a statement, Erekat warned that “Palestine” could disappear from the political map for 100 years because of Israeli policies. He further claimed that Israel controls the Jordan Valley, and 54 percent of this area is defined as closed military areas, 22 percent is nature reserves that will be turned into “settlements”, 16 percent are already existing “settlements” and only the remaining 8 percent is for the Palestinians. 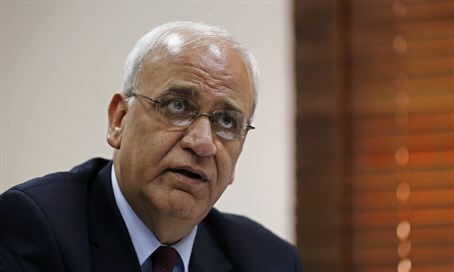 Erekat also declared that a Palestinian delegation will meet soon with the Israeli side in order to update the definition of relations with Israel. If this threat sounds familiar, it is because Erekat and other PA officials have repeatedly threatened in recent months to change their policy with regards to Israel and cease relations with it. Last March, the PLO's Central Council decided to end the security coordination with Israel, and Abbas warned in his UN speech in September that the PA was no longer committed to the 1994 Oslo Accords. Abbas has repeatedly threatened to cut ties with Israel and has in the past also hinted at plans to dismantle the PA and thus enact a serious blow to Israel through international legislation.